A commercial diver is someone who has been trained as an advanced diver and is able to perform a wide range of tasks related to underwater industrial construction. They use scuba gear to go below the surface of the water to inspect, repair, remove or install equipment and structures. They may use a variety of power and hand tools and may conduct tests or experiments, rig explosives, or photograph structures or marine life. Commercial divers work in one of two types of categories and environments (although some may spend time dabbling in both). Working offshore takes place in oceans; usually encompassing jobs related to oil platforms, exploration and salvaging, and pipelines; and is widely considered the more dangerous and demanding area of commercial diving. Working inland takes place in non-ocean locations like rivers, lakes and harbours; generally involving more engineering-related tasks, such as building or repairing bridges and dams; and can allow for more flexible and less stressful work schedules. What does your job entail? I am a commercial diver. During the summer months I dive for scrap metal from modern shipwrecks, and for two weeks of the year I dive out my allocated perlemoen quota. However, my real passion lies in the challenge of researching and hunting for treasure from shipwrecks. Why did you choose this profession? My mother will tell you that I was a water baby as a toddler. I grew up in Sea Point, so spent a lot of time in or near the sea. I often boogie boarded, and began diving and snorkelling at the age of 12. I am very comfortable in the sea and have always loved exploring its depths. What training did you undergo? At the age of 16, I completed my first Open Water I scuba diving course at the Dive Centre. I then ventured to the South of France and sailed around the Mediterranean for two years. 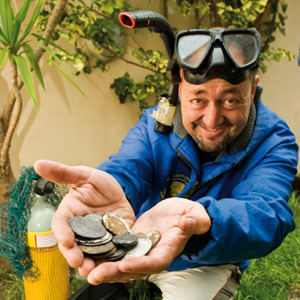 Upon my return to South Africa, I completed an amateur marine archaeology course at the Maritime Museum that deepened my passion for the sea and sparked my interest in the conservation of ancient underwater relics, as well as in the quest for finding treasure. Yes, it is possible to feel passionate about both! I strongly believe in the preservation of artifacts for the sake of history and art, but also enjoy the challenge and prospect of seeking a potential fortune. What type of personality makes a good diver? You need to be passionate about the sea and her endless mysteries. It is also important to enjoy history and searching for clues, and have endurance and drive; you’ll spend countless days at the archives just trying to find one clue! You also have to be physically fit and have good sea legs in order to withstand choppy waters when on a boat. Is experience as important as formal training? Formal training is fundamental and the only starting point. But experience gives one the opportunity to find out if you actually have the sea legs. Describe a typical day As a commercial diver (perlemoen, metal and treasure) I have to prepare the night before for an early start the next morning: diving gear packed, safety equipment verified, permits and documents on hand, boat fuelled, aqualungs filled with air. We are usually a team of three people: one skipper to man the boat and two divers. What do you love the most about your work? Escaping the daily humdrum into a world of serene beauty. Is there anything you don’t like? The freezing-cold water in the summer months. Tell us a future goal I dream about finding a treasure ship laden with coins! Certification is required to work as a commercial diver. There are certain entry requirements that pertain to most of the diver training courses. A National Senior Certificate is a prerequisite for some training courses. It is recommended to have a Recreational Scuba Diver ticket and a certificate from a designated medical practitioner indicating a pass on a medical examination. It is also recommended to have completed a sport scuba course and have a minimum of 10 scuba dives. It is important to ensure that the training programme you then follow is accredited and registered with the Department of Labour, and is recognised by the IMCA International Diving Division, in order to successfully pursue certification upon graduation.